Easter Bay Airport is an airport in Grand Theft Auto: San Andreas based in San Fierro, San Andreas. Based on real-life San Francisco International Airport, the airport is the largest airport in the state by area. It is situated at the southeastern corner of the city, just east of Foster Valley and a major freeway, and just south of Easter Basin. From here, the player can purchase Juank Air flights to and from Los Santos International Airport and Las Venturas Airport, but no flights actually take off or land without the player instigating it. As befits a busy airport, there are numerous aircraft parked in various locations, and Baggage carts trundling about. There are three main points of ground vehicle entry to the airport - the first is through the underground parking lot which terminates behind the control tower where the helicopters are; the others are through two direct freight ramps in the center of the airport, one leading to the runway, the other to the hangars. One note: the gates governing these points of entry are only accessible once the player has passed Flying School and is considered a pilot. Through ingenuity, the player can access the tarmac, but all aircraft are locked until pilot status is achieved, with the exception of the Maverick in the area near the hangars. This airport, as aforementioned, is modeled after San Francisco International Airport, which is located several miles south of the city. The main landing strip of Easter Bay Airport (pictured) extends out into Easter Bay, a distinguishing feature of San Francisco International Airport, whose main tarmac extends into San Francisco Bay. The airport is situated on an artificial island connected to the mainland by a small land bridge that provides the only road access. The airport plays a role in two missions. In the mission Mike Toreno, Carl Johnson and T-Bone Mendez track Mike Toreno in a yay van in the airport. Carl destroys it, and heads back to the pleasure domes in Battery Point. In the mission Ran Fa Li for Wu Zi Mu, Carl picks up a package from a Manana inside the parking lot of the airport, and has to take it back to a garage in Esplanade North, all while constantly being confronted by the Da Nang Boys, fierce rivals of the San Fierro Triads. In the beta version of the game, Easter Bay Airport's landing area was smaller. Oddly, in the booklet guide, it is not named Easter Bay Airport, but San Fierro Airport instead. However, in real life, it is not unusual for airports to be known by different names. One unique stunt jump starting in Red County requires CJ to jump across and onto the airport property. Completing this jump before San Fierro is unlocked for exploration triggers a 4-star wanted level. Maverick: To the immediate northeast of the southern-most hangars - Always unlocked regardless of the player's progress in Flight School. Nevada (2): One is directly east of the south end of the terminal; north of the Maverick, the other is located to the west of the Leviathan. The former is sometimes colored blue. For the last one, photograph the large tanks, next to the Heat-Seeking Rocket Launcher. 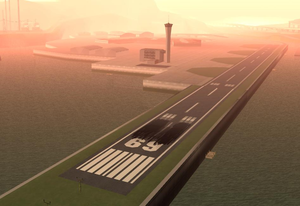 The airport's layout and position as depicted on GTA San Andreas' in-game map. Overview of the airport towards the northeast, from atop the Easter Tunnel, GTA San Andreas. The airport's distinctive entrance, GTA San Andreas (Rear view). Closer view of the airport's terminal building, GTA San Andreas. The airport's control tower in GTA San Andreas. Note a pair of red doors on the left side of the building, presumably for the airport's fire station. Tunnels connecting the lower level of the airport's terminal building to underground car parks, GTA San Andreas. One section of Easter Bay Airport's extensive underground car parks in GTA San Andreas. This page was last modified on 18 April 2015, at 22:44.